Developed by the North Carolina Wildlife Federation (NCWF), the Farmers and Communities Manage Deer (FCMD) project has successfully demonstrated that when farmers, sportsmen, and community groups work together, deer damage to crops can be reduced, farm income and community revenues can be improved, and high-quality ground meat can be efficiently processed and delivered to those who need it most. This program is a collaborative effort with NC Hunters for the Hungry and financial support comes from the NC Tobacco Trust Fund Commission. 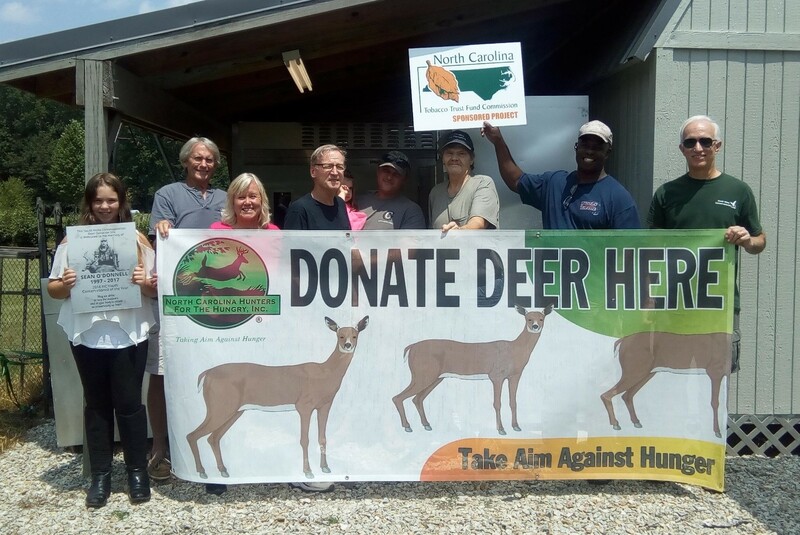 Tens of thousands of pounds of ground venison have already been delivered to food pantries in North Carolina through this program’s reach. Hunters may drop off legally harvested deer during the fall hunting season at any one of 26 participating locations statewide. With new sites opening every year, hunters are encouraged to check out a current processor map online at www.nchuntersforthehungry.org to determine which site is most convenient to them. Here’s how the program works: Hunters donate legally harvested deer throughout the fall hunting season at a participating donation site. Deer are then processed at an NC Department of Agriculture and Consumer Services-inspected facility that has been pre-qualified to participate in the NC Hunters for the Hungry program. FCMD volunteers work with community champions to raise deer processing funds locally, making it both free and easy for hunters and community food pantries to participate. The ground venison is a high quality, natural protein source that is then distributed to those in need by local food relief organizations. Farmers may participate in the program by encouraging hunters to donate deer or by supporting their local community donation site through a charitable contribution to this 501(c)3 non-profit initiative. These donations are used to reimburse deer processors for their expenses and may be tax deductible. Every $50 donation to NC Hunters for the Hungry will provide high quality protein for an average of 160 meals. Designating funds to a specific deer donation site will ensure that your contribution is dedicated to deer processing in your local area. Please visit www.nchuntersforthehungry.org to make a financial contribution to the program. Additionally, landowners needing assistance with deer management can call (919) 833-1923 to obtain further information. Thank you for helping to manage deer in your local community!